Delcam will demonstrate the latest version of its ArtCAM JewelSmith software for jewellery design and manufacture at the Spring Fair exhibition to be held at the NEC, Birmingham, from 6th to 10th February. This latest release incorporates a library of 3D component models, together with extra options to speed the design of new products. ArtCAM JewelSmith is already widely used by designers, model makers and manufacturers of all types of jewellery, whether it is bespoke, custom-made pieces or mass-produced items. In all cases, it has given improved productivity, higher quality and significantly reduced lead times. The software has been particularly successful in the design and manufacture of rings, including all types of signet and cluster rings, with multiple or single stone settings. 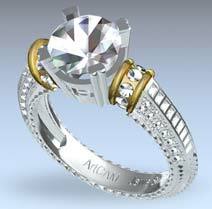 ArtCAM JewelSmith incorporates a library of 3D models of standard gems, settings and shanks that can be used as 3D clip art to build up ring designs both quickly and easily. It also includes options for users to describe their own items for inclusion in the library. The software provides constant access to the overall design as it is built up from the component models. In addition, assemblies can be created of groups of components, stored in the library and added to the design in the required orientation. All assemblies and components can be manipulated in 3D space, making positioning of design elements or gem settings around a ring both easy and intuitive. Assemblies can also be subtracted from ArtCAM JewelSmith models to create exactly matching sockets and recesses. For example, an unusual gem setting could be fitted to a standard shank by directly ‘punching-out’ the setting assembly from the shank model. Other recent enhancements include two extra modelling options – Taper Relief, and Mirror and Merge Relief. The first of these gives the ability to pick a point on a model and taper it down by a defined percentage, either over a certain distance, between two vectors, or radially from the centre to the edge of a vector. This will be useful when adding taper to the sides of rings and will also allow easier merging of two reliefs whose combined heights would be too great for the design. The Mirror and Merge command will make it quicker and easier to create symmetrical models. At all stages, the software offers the ability to "undo” edits to the design. This allows mistakes to be corrected even after a number of subsequent changes to the model have been carried out. It also makes it easier to experiment with new ideas, without risking the loss of work already completed on the design.